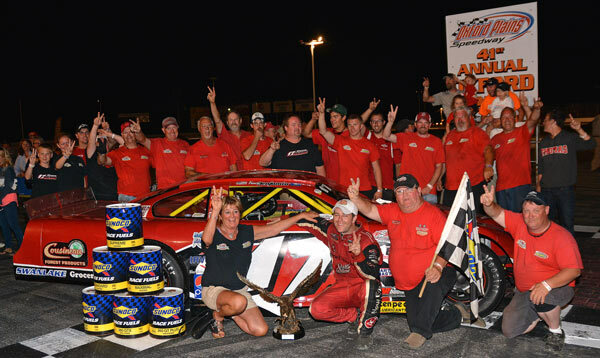 The 41st running of the Oxford 250 was a crowd pleaser as sixty of the best Super Late Model teams in the country converged on the small town of Oxford, Maine to participate in the historic event. The fans were treated to over seven hundred laps of racing, with several teams collecting checkered flags, but none as happy and as excited as Travis Benjamin, whom collected his second straight $25,000 payday, plus lap money. Forty-four Super Late Models lined up on the grid with Concord, N.C. speedster, Preston Peltier and Turner, Maine�s, Shawn Martin filling the front row when the green flag flew. Peltier jumped to lead and held the point for the first 21 laps with the exception of lap six when Kelley Moore edged him out at the stripe. Joey Doiron raced by Peltier on lap 21 and held the point for the next 66 laps with Austin Theriault, Shawn Martin, Scott Mulkern and Moore in tow. Theriault held the lead through four restarts before he and Travis Benjamin pitted for tires and fuel on lap 185, setting the stage for a storybook ending. Cassius Clark took over the lead from Theriault as pit stops completely changed the lineup around. DJ Shaw, Richie Dearborn, Scott Moore and Johnny Clark were all now in the top five and ready to challenge for the lead. Clark held the lead all the way until lap 220 when Richie Dearborn edged him to the stripe when the final caution waved. Dearborn took the lead at the green, but Benjamin and Theriault were right on his heels. Benjamin made his move on lap 227, grabbed the lead and set sail towards the checkers. His only obstacles included heavy lapped traffic, and the #57 of Theriault. Theriault tried every move in the books looking inside and outside, but Benjamin would not be denied his second Oxford 250 win in a row. Theriault raced home second from his sixth starting position, ahead of Dearborn who actually had to take a provisional to get into the event. Dearborn started 40th on the grid. Cassius Clark took home the 4th spot ahead of OPS regular, TJ Brackett. Rounding out the top ten were Tyler Dippel, Derek Ramstrom, Ben Rowe, David Oliver and Shawn Martin. Heat checkers flew for Peltier, Martin, Kelley Moore, Tim Brackett, Daniel Hemric and Theriault. 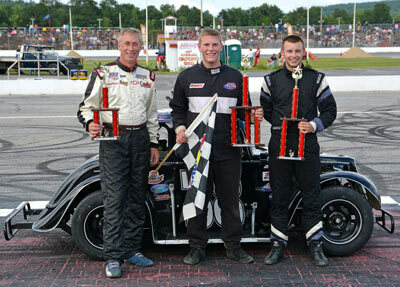 Consi victors were DJ Shaw, Benjamin, and Brent Dragon. David Farrington Jr. was awarded the win in the Last Chance Race as apparent winner Travis King failed post race inspection as his car was too low. Oxford 250 sidebar: Travis Benjamin started 27th and drove to the win. Mark Lucas took advantage of another driver�s displeasure to capture the inaugural Mayhan Antiques & More 75 lap main event. 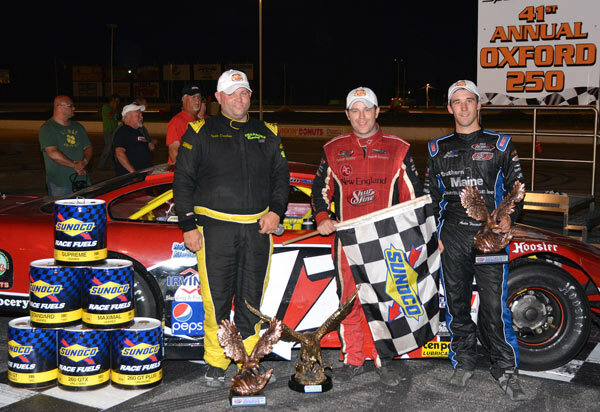 Other support division winners visiting Allen�s Coffee Flavored Brandy victory lane on day three of the Oxford 250 weekend included Josh Childs, Mathew Bourgoine, and Kris Watson. Joshua Brown was headed for an easy win in the PASS Modified race, but tangled with a lapped car around lap 50. Contact sent the #05 of Ron Henry around in turn three bringing out the caution. The field raced back to green with Brown pulling away once again. Mitch Miller raced his way to second while Mark Lucas and Andy Shaw battled for third. Lucas raced by both Shaw and Miller to take over the second spot, but had nothing for Brown until Brown was run high by Henry in turn four allowing much of the field to race by, handing Lucas the lead. Lucas cruised to his second win of the weekend, and the hefty $1,000 payday. Miller placed second ahead of Shaw, Brown and Billy Dixon. Matt Bourgoine paced the field in the 50 lap NELCAR Legend National Championship race. Reid Lanpher was a distant second followed Andy Santerre, Alan Small, and Bob Weymouth. Chris Watson picked up another win in the Maine Outlaw Series feature as he defeated Duane Seekins, Bobby Seger, Deane Smart and Kris Matchett. Josh Childs turn Saturday�s misfortunes into Sunday�s victory as he captured the Allen�s Coffee Flavored Brandy Street Stock feature. Zach Emerson placed second ahead of Tyson Jordan, Richie Morse and Richard Spaulding.